It's your goal to keep the Baby Balloon Animals from flying off into outer space! As the Baby Balloon Animals try to fly away you must quickly "pop" them to bring them back down to earth! 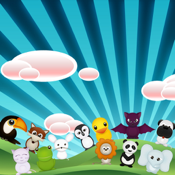 Each level gets harder with a new Baby Balloon Animal added! Can you pop ALL the Baby Balloon Animals from the sky? Will you make it all the way to Level 100? You've gotta have a fast finger to do it, but it is possible! You will have lots of fun popping the Baby Balloon Animals and don't be surprised if your fingers start to hurt!